In this Post, I am going to discuss one of the other new features of ASP.NET 4.5. That you’ll like. I’ll also try to make it simple and include step by step tutorial so that you can implement at your environment. Now a days, you guys must have seen that almost all leading websites allow you to login with your other accounts/credentials. It may be Facebook, Gmail, Twitter, Microsoft and many other. I like this feature very much because a user don’t need to register on every website where s/he wants to login and reduce the login credentials count drastically and make life simpler. So Facebook, Gmail, Twitter… works as Identity provider that provides there APIs that one can integrate with there application and allow user to login with their Facebook, Twitter, Gmail… accounts. There are various ways to implement it and they work on some standard protocols so that everybody can understand their API. Currently, most leading identity provider follow OAuth standards and OAuth provides a process for end-users to authorize third-party access. So now let’s come to ASP.NET. ASP.NET 4.5 new template has the required code already in place that you require to write to uses the third party Identity provider. You just need to enter some required Ids and secret keys and once you provide it. It’ll start working. So let’s first create a ASP.NET application as FILE|NEW|Web Site|ASP.NET Web Forms Site. Now if you open the solution explorer, It has created lots of files and that provides many feature already implemented, you must have seen in earlier version as well. I assume you have basic Idea about all that. Now let’s open a file under App_Code/AuthConfig.cs. Now if you check this file has several lines of commented code. If you see that closely, then actually it adding authentication clients like Twitter, Facebook, Microsoft, Google . Now here, you need Id and secret keys for the authentication clients that you need to provide. You can see two buttons Twitter and Google. A user can use these accounts to login. Let’s click on twitter. here I can change my my user name and I changed it as Brij. As soon as I click on login, I am authenticated and you can see that I am now loggedin. Now if you click on the user name (Brij) shown in above pic right corner, It shows the following page. It allows you to set a local password. After setting your local password you won’t need to your login via Twitter to authenticate the current website. Now if you see the last section, it shows twitter account which is used for login. Also, you can see after login with two accounts, it shows a remove button to remove any authentication. And as soon as you’ll click on any remove button that authentication will get removed and other remove button will also be removed. Because for login, at least one authentication is required. Now I’ll tell you, How I created Ids and secret for my local App. To create appId and secret from Twitter go to link TwitterApp . Put the name and description of your application. Now, put the URL of the your local application. A caveat, you cannot put the URL generated by Visual Studio integrated server. 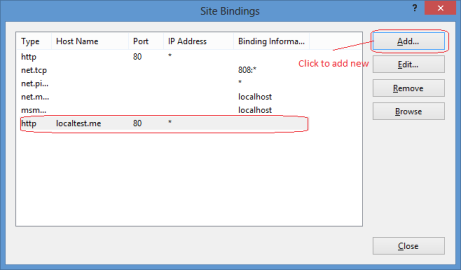 So host your application at local IIS but twitter wont accept localhost URL as well. You need to have some URL that be hosted on some domain. So how can you mimic that scenario on your local server. I have found a interesting testing domain localtest.me . This is not localhost.me but localtest.me. So my application URL for twitter was http://localtest.me/testdomain/Default.aspx. So once you’ll put all these and save. You’ll get Key and Secret that you can use for your ASP.NET 4.5 local application. So you have seen, How ASP.NET 4.5 simplified our life by providing inbuild mechanism for using other leading authentication providers. We as developer don’t need to worry about underlying complex logic. Just need to provide some AppIds and Secrets and Google does not require any Id and secret as well. Hope you all have enjoyed. 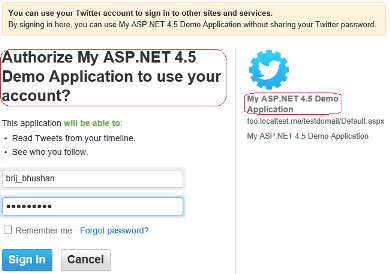 This entry was posted in ASP.NET 4.5, Authentication and tagged ASP.NET 4.5, Authentication, Facebook, Google, Twitter. Bookmark the permalink. what version of Visual Studio you used?